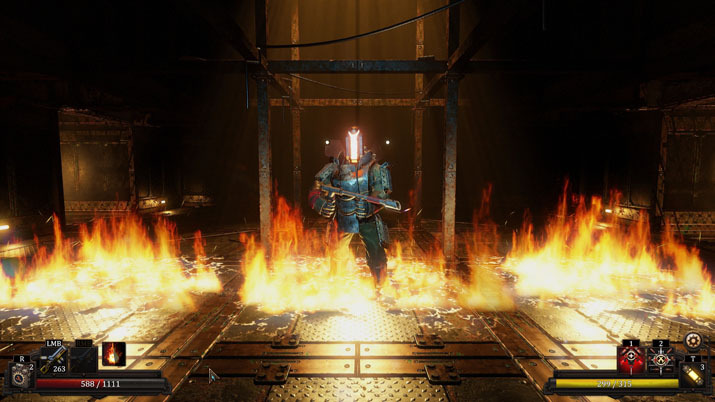 According to Fatbot Games, the company that created Vaporum, It’s a “grid-based, single-player & single-character dungeon crawler.” Vaporum is a steampunk-themed game that feels like a step back to when games were simpler, which is fitting, considering that it draws inspiration from series like Eye of the Beholder and Legend of Grimrock, both first-person dungeon crawling RPGs. Gameplay is fun, graphics are beautiful, the sound is spot on, and combat is a trial of tactics and wit. Sprinkle in some puzzles, and you’re playing a type of game that time has forgotten, revived for the modern world. But the question I had to ask while playing: is this a good style to revive? From the moment I started the game, I was impressed. The opening cutscene is fully voiced. What was more surprising was how well done the voicework is throughout the title. The main character awakens in the middle of the ocean, at the foot of a titanic, steel structure ascending towards the sky [EN: Sounds almost familiar]. He enters, and the game begins. The first room is a small entrance hall. A locked door on the other side impedes progress. To both sides of me are valves I know I have to turn to progress, but I take a few minutes to admire the welcoming scene. A light shines through a grate on the ceiling, revealing a damp spot on the floor. Water drips down with its respective sound effect. The grates are casting a checkerboard shadow on the floor of light and dark, on either side of me are large water-pump looking bits that enforce the idea that I should be turning the valves, but I’m not done admiring the scene just yet. This beginning moment sets the artistic tone for the rest of the game. I’d soon be fighting through dark, creepy metal bowels, well-lit libraries with wooden floors, and musty storage rooms filled to the brim with old, rotting crates, and then the bowels again. Repetitive assets are Vaporum’s major flaw. By the fourth level of the game, I had encountered almost every enemy. I wouldn’t be finding any new foes until the last four levels, which was a primary source of blandness considering that the game is a whopping thirteen stages. Vaporum is huge. Levels can take an upwards of forty minutes to an hour, and by the end, I had clocked in roughly fourteen hours, including stopping to find some hidden secrets and listen to the game’s story: which is revealed through notes and recorded messages left behind. While this isn’t a bad thing, I felt like the experience could’ve at least used some new assets; maybe different enemies to spice up the levels so they wouldn’t rely on various puzzles to keep gameplay fresh. The puzzles are fun and still challenging enough to twist the brain in just the right way to get those juices flowing. There’s enough of them to add breaks from the exploration and combat in levels, but not too overdone to the point that encountering another puzzle feels like an impediment more than a challenge. All puzzle concepts were always fresh too, as opposed to the repetitive nature of almost everything else in Vaporum. Secret rooms and chests could be found by completing “optional” puzzles, or by finding hidden buttons and levers, and these chests were always worthwhile. Finding weapons, like a Warhammer that stunned enemies or a pistol that could deal damage to a row of foes, was rewarding. Combat itself felt like a brain-teaser at times. Winning battles required a mix of analyzing enemy movements, dodging attack patterns, and being evasive enough to avoid being boxed into a corner. Robotic threats like mechanical spiders that could cover areas in acid added variety to combat and when combined with other enemies, actually made for some challenging battles, but as I stated earlier: I had seen every enemy, every attack, by level 4. I would be subject to repetitive combat until late game. Looking back, Vaporum is a good case against reviving games that play like Eye of the Beholder or the newer Legend of Grimrock. It felt repetitive at times, but not like it failed in achieving any of the goals it set out to conquer. Combat is fun and challenging, puzzles were varied and interesting, and the graphics did bring a nice, modern-day look to a forgotten genre. Looking at the same assets over and over for most of the game didn’t give me a lot of incentive to look forward to the next level, but I didn’t feel like quitting either. The game had an interesting story, which made me feel excited when I found new notes or recordings [EN: Sounds familiar again, for those keeping score at home], and finally finding out what happened to the main character was interesting [EN: I mean, you know what I’m gonna say]. Ultimately I think Vaporum deserves a sequel. A sequel that doesn’t need to fix anything as much as it needs to have a larger scope: the number of levels was enough, but I really would’ve appreciated maybe ten, or even eight, levels that felt more in-depth and detailed — as opposed to repetitive.